Now that the clamour surrounding the 14th Finance Commission, the Economic Survey and the Union budget has subsided, it is time perhaps to sit back and reflect on the loads of sermons recently delivered by those who matter on the current and future state of Indian economy. Curiously enough, the budget speech expects the economy to grow at the rate of 7.4 per cent during 2014-15, when the Economic Survey itself has expressed doubts on that score. To quote from the first volume of the survey, “Until a longer data series is available for analysis and comparisons, and until the changes can be plausibly ascribed to the respective roles of the new base, new data, and improved methodology, the growth narrative of the last few years may elude a fuller understanding.” However, in spite of the caution so expressed, the survey, too, projects a growth rate of 8.1-8.5 per cent for the year, 2015-16. If this is not awkward enough, the observation made on March 5 by the Chinese prime minister, Li Keqiang, that China’s growth rate has reduced to around 7 per cent and may move up to 7.4 per cent next year amidst more “formidable” difficulties should make us wonder. What is so special about India that makes our government express grand euphoria? Apart from the growth-rate estimate, it appears that the consumer price index inflation rate has fallen to 5.1 per cent and the current account deficit to 1.3 per cent. These, according to the government, indicate that it has succeeded in turning the economy around dramatically, restoring macroeconomic stability and creating conditions of durable double-digit growth accompanied by sustainable poverty elimination and job creation. Once again, a contradiction of sorts crops up here, given the Economic Survey’s observation that estimates of employment growth in India are “noisy” at best, and that the elasticity of employment growth relative to economic growth has declined in the 2000s compared to the 1990s. The last observation ought not to raise eyebrows at all, since the information technology revolution continues with grim determination to make technologies increasingly robot-friendly, turning gainful employment of human beings, especially unskilled labour, into an impossibly complicated business. And this is a dilemma that afflicts not merely the IT sector, but most of modern manufacturing as well. If labourers themselves are irrelevant entities, one cannot be sure any longer how India will manage to appeal to capital, be it foreign or domestic, to employ its much advertised pool of cheap labour. In this context, the government should perhaps be commended for its announced intention of allotting additional funds towards the MGNREGA scheme for asset creation. One does not know yet what the nature of these assets will be, but hopefully they will open up avenues for employing students that the government has promised to help graduate from secondary schools across the entire country. Of course, since these goals, too, will be linked to technology-driven direct benefit transfers – the Jan-Dhan-Aadhaar-mobile-number trinity – one needs to wait and watch how smoothly the job-creation aim is fulfilled. Leaving the nitty-gritty aside, there is a deeper issue of economic philosophy that the budgetary exercise appears to propose. To appreciate the matter, let us quote again from the budget speech, “Our stated policy is to avoid sudden surprises and instability in tax policy.” And this observation is supplemented by yet another. The government will create an atmosphere of “minimum government and maximum governance to improve the ease of doing business”. The idea of avoiding surprises as an economic policy, along with a small size of the government, goes back to Nobel laureates like Milton Friedman and Robert Lucas of the Chicago School and the so-called “rules versus discretionary policy” debate. According to these prescriptions, the government ought to interfere as little as possible in economic activities by announcing a predictable (monetary) policy. It should also restrict itself mainly to governance alone, reducing thereby the size of the public sector. Any other plan of operation on the part of the government, claim the proponents, will lead to cyclical chaos. The American economy played for a while with the Chicago philosophy and the outcome was not particularly encouraging. Indeed, if the Chicago policies had any merit in them, the world would have been spared of the sub-prime crisis. Nonetheless, the present Indian government’s intentions probably have the blessings of organizations like the International Monetary Fund and the World Bank. India, of course, is a small player in the world economy. Hence, any economic disaster arising from the policies it adopts will largely be confined to India alone. Going by the recommendations of the 14th Finance Commission, the increased devolution of the divisible Central pool among states, along with a withdrawal of the Centre’s participation in Centrally sponsored schemes, appears to indicate that the Union government, at least, is getting ready to reduce its participation in economic activities, if not immediately, at least in the foreseeable future. If it succeeds in unleashing these policies, Chicago could begin to appeal to the state governments as well. One tends to worry about the final outcome, but the fact that the government has restrained itself from big bang reforms in one go is cause for relief to say the least. Some believe that the apparent change of heart is linked to recent political reverses. As far as job creation goes, technological barriers stand in the way, except probably in the case of small-scale enterprises. Regarding competition, investment and so on, an elementary Keynesian logic suggests itself. If we were to divide our population into two broad groups, rich and non-rich, the owners of corporate enterprises will mostly belong to the first group. Notwithstanding the ultra-rich individuals (as distinguished from corporates) whose tax surcharge has been raised, it is a reasonable guess that the policy of reducing the corporate tax rate, leaving tax rates for individuals unchanged, will raise the share of the disposable income of the rich in aggregate national income relative to that of the non-rich. Since the rich tend to spend a smaller fraction of their disposable income on consumption compared to the less rich, the result of the tax change will be a fall in the average propensity to spend out of total income in the country. Falling oil prices might reduce prices of commodities for a while, but expenditure as a whole might nonetheless decrease. If this were to happen, then the market size will shrink and it is not clear why a shrinking market will attract greater investment, leave alone create more employment. Immediately following the budget presentation, however, the Central Bank has unexpectedly lowered the repo rate and this could produce an overall downward pressure on the commercial banks’ prime lending rates. This is likely to boost the real-estate market. 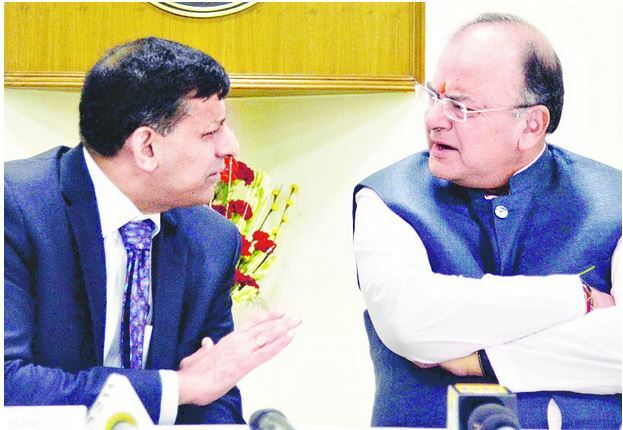 Besides, a low interest rate regime will bring India closer to the United States, Japan and the Eurozone. The Indian stock market will consequently be a less attractive destination for foreign funds, thus depreciating the rupee. Indian exports could well gain from the resulting fall in the dollar price of domestically produced Indian commodities. These possibilities should move in a direction opposite to the earlier noted negative pressure on India’s commodity markets. The net effect is not obvious, needless to say, but if the markets expand, the credit will go to the Central Bank’s discretionary as opposed to non-discretionary monetary policy, rather than the fiscal stance of the Central budget.